$195. 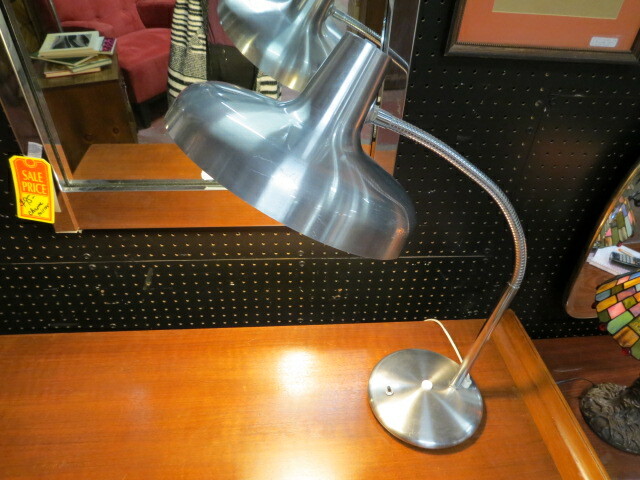 Vintage mid-century modern brushed chrome gooseneck lamp made in France, c. 1970. Made in France by Art Specialty Company. Round base with on/off push button switch, long gooseneck, round shade, 1 bulb. rewired. Perfect for your desk or nightstand. Very good condition. Shade measures 12in diameter, base measures 8in diameter, entire lamp is 24in tall.